Dry stone walls are synonymous with the Cumbrian landscape. From shore to fell, defining fields & boundaries, or enclosing cliffs and other terrain dangerous to farm animals, they criss-cross our land The complex local geology means a wide variety of stone occurs across the Lake District, and this is reflected in the various styles of wall construction. Walls also protect & shelter a wide range of wild life from voles, to frogs and toads and slow worms, lichen, mosses and ferns. This Website site reaches a widespread audience, the majority of whom are not wallers and may not even live in Cumbria, but are keen to follow us. 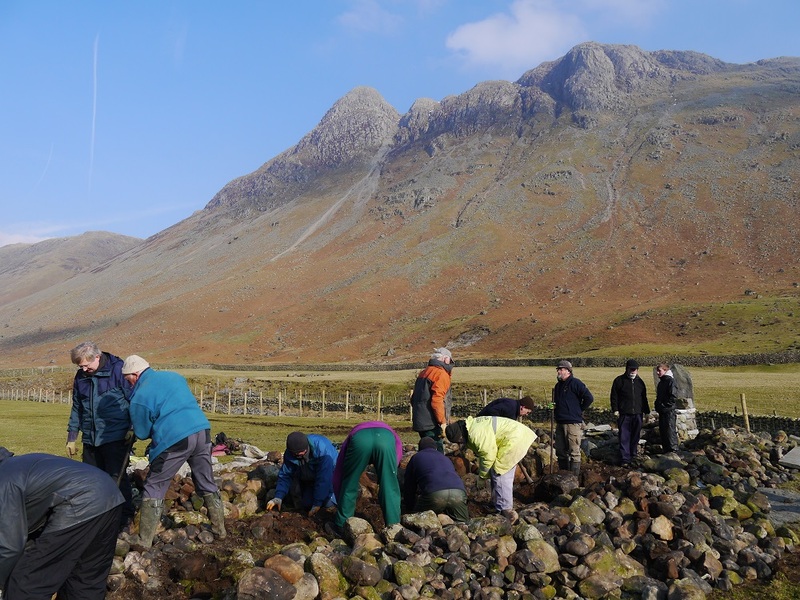 If you want to help keep dry stone walling alive, restore and preserve the landscape we love and help us promote the craft to a new generation of wallers, you can do so by joining the Cumbria branch of the national Dry Stone Walling Association as an Open Member. You can support our activities, receive our newsletters and come along and watch us at our monthly meets. Bring the dog and the family (neither compulsory! ); bring a picnic and enjoy a day in our company! Browse this website (there are many photo examples of wallers at work) Or go to www.dswa.org.uk/membership to find out more.You‘ll be made very welcome and, who knows, you might be tempted to join in! Come & join us! We’re not always this dirty!!!! For those who wish to build a wall without cement! Contact us for details of beginners' courses and for more advanced walling techniques.